I love natural soap! So when my friends at Eco Natural Soap asked me to try out some of their natural bath & body products - I was really excited! Exotic Butters Luxury Skin Balm (Citrus Blend) Out of all the products I tried out - this one was my all-time favorite! My hands tend to get really dry this time of year and this is the perfect pick-me-up! The scent is energizing and the balm is light and doesn't feel sticky. The Citrus Blend is made from 100% Essential oils Pink Grapefruit, Lemon, Tangerine and Sweet Orange. - I love it! Shea, Jojoba & Flax Bath & Body Bar (Pumpkin Spice): This soap smells so good! When you use it- you'll feel like you're breathing in the holidays! I also love it because it has a nice gritty texture - so it's kind of like a scrub too! Varicose Vein Circulation Relief Balm - this is a great balm for your Varicose Veins - I swear it minimizes the appearance of mine! Cuticle & Nail Relief Balm: Like I said earlier, this time a year my hands are a dry mess! So I love using this balm on my cuticles! It has a nice light scent and goes on very smoothly. The balm is in a stick form so it's easy to throw in your bag and go! "Lip Relief" All Natural Lip Balm. This product might look like your average chapstick - but it definitely isn't! I love this balm because it keeps my lips soft ans moisturized - for a long time! Sometimes I'll put this on while I'm running around at work and hours later I'll notice my lips still feel smooth! I love it! I tested out the unscented version, but it comes in a variety of scents/flavors! Eco Natural Soap products are 100% Pure, Natural, Organics and Essential Oils. They never use artificial colorants, fragrances or preservatives in their products! Buy it: Looking for the perfect holiday gift with a handmade touch? 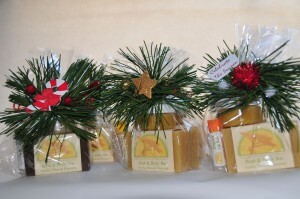 Eco Natural Soaps has a ton of beautiful holiday gift sets under $20! This Bath & Body Citrus Sunrise set is only $17.50 and comes with 2 Bath and Body Citrus Sunrise Bars; 1 Exotic Butters Luxury Skin Balm (Citrus Sunrise) and 1 “Lip Relief” All Natural Lip Balm (Citrus Sunrise). Buy a couple of these today and dross some of those names of your holiday shopping list! *Open to US Residents only. I was provided with a product in order to write this review - all opinions are my own. I would love to try the Lip Relief.I have never used anything from here,so this is what I would like to try,not necessarily my favorite. I subscribe via Google Reader,blssdmmm1.Email above is contest/giveaway only. I like Eco Naturla Soap on FB,Tonya Wilson.That is my FB for all products so my personal FB does not get overloaded with stuff. I'd love their lip relief -- it's so dry here. I subscribe via gfc reader. I would love to try the nail and cuticle relief balm - my nails need help. I think the lip balm in citrus sunrise would be a good one to try! I already "Like" Frugal and Fabulous on Facebook ^_^ Thanks for the giveaway! sue bunting Subscribe to blog via feedburner. that I would like to try. i subscribe via feedburner Google! I Follow @econaturalsoap and @lindsfrugalfab on Twitter and tweeted about it! I like Eco Natural on FB! suebunting1977@gmail.com sue bunting Subscribe to blog via feedburner. I like the Pet Shampoo and Coat Conditioner Soap. I would love to try the Romance Perfume! I want to try this for sure!!! Awesome giveaway! I want to try their Cuticle and Nail Relief Balm - I haven't tried a balm for this before! I would love to try the gift sets! They are done up so pretty and they look/sound like they would be very nice! Can't choose which one though that I would like best lol...They all look good! Left side, all the way down the list. The cuticle and nail relief is something i could defintely use! I really would love to try the Lip Relief! I'd love to try the Exotic Butters Luxury Skin Balm (Peppermint)!! I "like" Frugal and Fabulous on Facebook!! As I am licking my dry lips, I think that Lip Relief is what I desperately need now that it is cold here! I would love to try the cuticle relief balm. "Lip Relief" sounds awesome! Can never go wrong with a good lip balm!